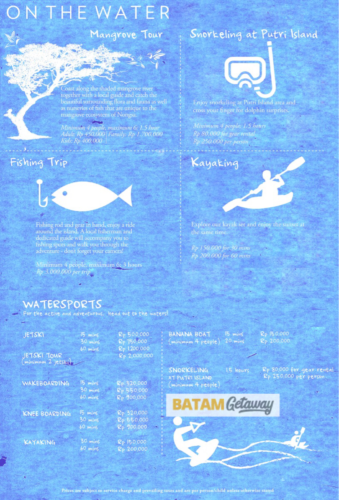 Did you know that there are 2 Montigo Resorts in Indonesia, one in Bali and one in Batam? 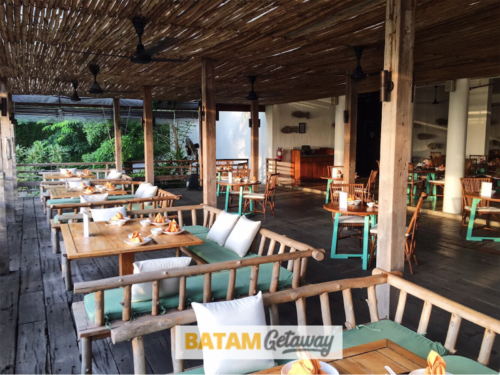 Montigo Resorts is one of the most popular resorts on Batam island. 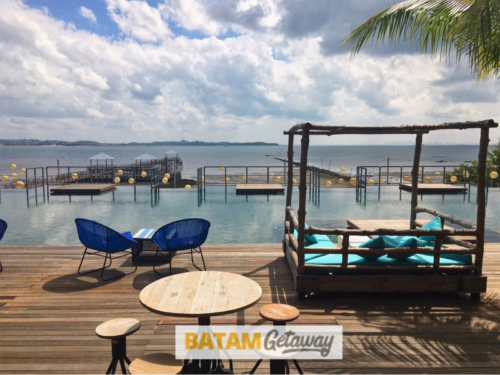 We hope this Montigo Resorts Batam review will help you to decide which resorts you should book for your next Batam trip. 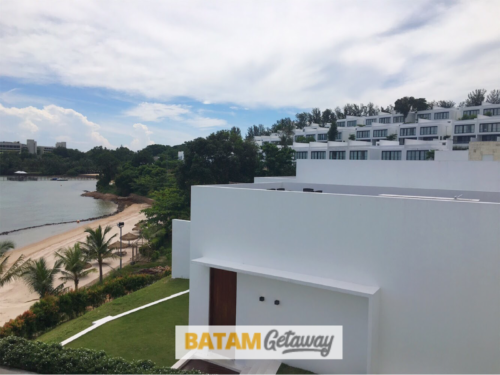 Located just beside Batam View Beach Resort, Montigo Resort Batam is located in the Nongsa area. 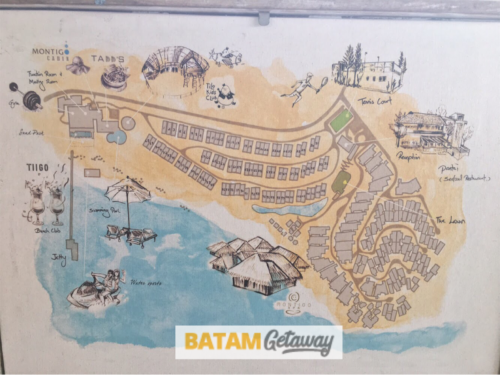 Other batam beach resorts in Nongsa are Turi Beach Resort and Nongsa Point Marina & Resort. 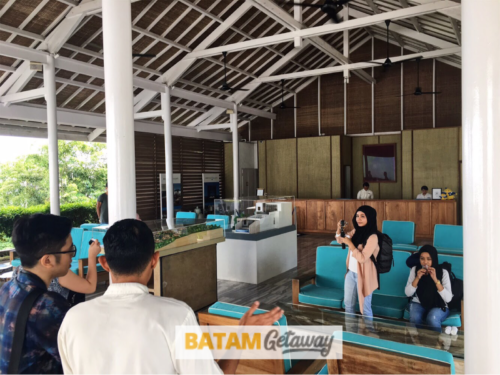 Taking a ferry from Singapore’s Tanah Merah Ferry Terminal, you will reach the island of Batam through Nongsapura Ferry Terminal in less than 45 minutes! Any nearer than this and you will just have to settle for the evergreen ‘Sentosa Island’. If you’re staying at the resort for more than 1 night and would like to explore the city a little, you can take the shuttle bus that goes to the main shopping area of Nagoya Hill. The bus ride will take you around 50 minutes and it has a fixed departure timing from Montigo at 10am and return timing at 4pm from Nagoya Hill shopping mall. The charge is S$6 per person for both 2 ways. Yes I know, we were as surprised as you are right now when we saw the lobby! Don’t get me wrong, it looks distinctively rustic, woody, and natural. It has an expansive and open-concept feel. It looks perfectly normal but we thought Montigo is more than normal?!? We thought it’s all about luxury and prestige? Hold your thought and let’s take a look further. 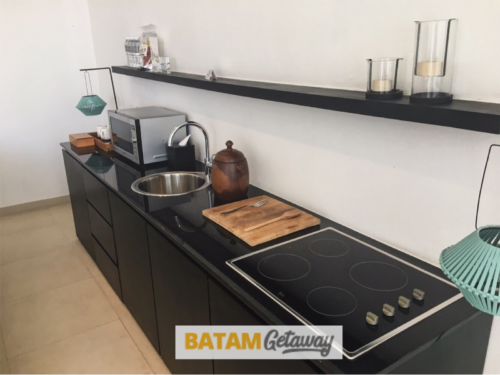 Montigo Resort Batam has 1-bedroom, 2-bedroom, 3-bedroom, 4-bedroom, and 5-bedroom villas. 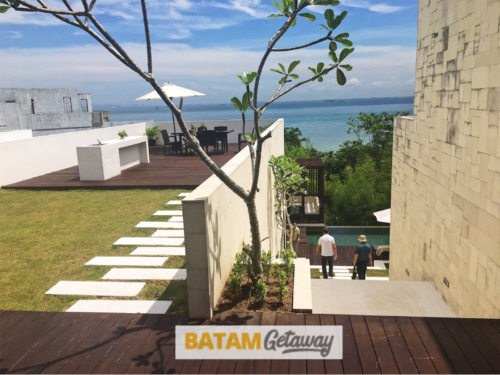 All villas in Montigo Resort Batam have the unobstructed & unbelievable sea views. Nevertheless, the 2-bedroom villas are most popular and being sought after the most. 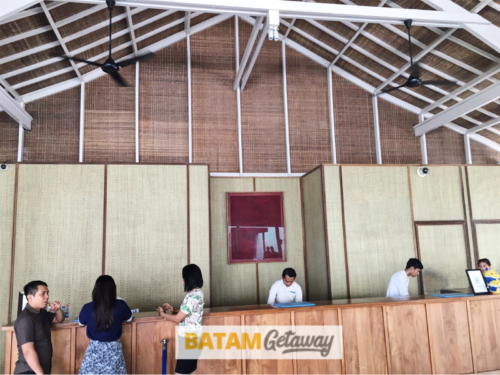 So in this review, we will cover the 2-bedroom villas as well as the resort’s amenities & activities. 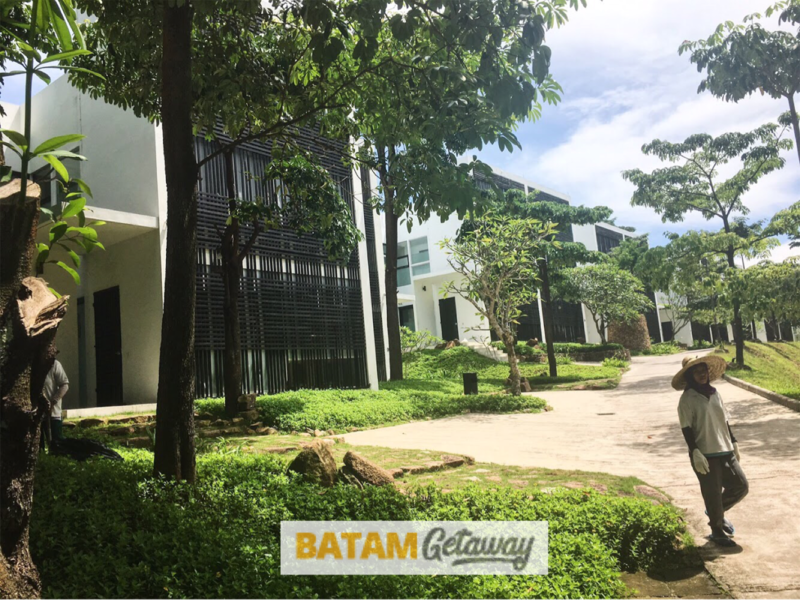 The 2-bedroom villas in Batam Montigo Resort are all 3-storey villas. There are about 40 of them and they come in the form of Hill Side Villa, Hill Top Villa, Seafront Villa, and Spa Villa. 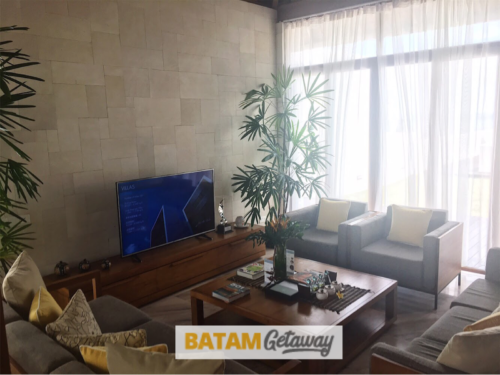 On the first storey of a 2-bedroom villa, we have a living room that really feels spacious and a balcony with a wonderful unobstructed sea view. Now this is where we start to feel the ‘classiness’ of the resort. The living room comes with a kitchenette and a bathroom. Now this is where the tinge of ‘completeness’ kicks in. 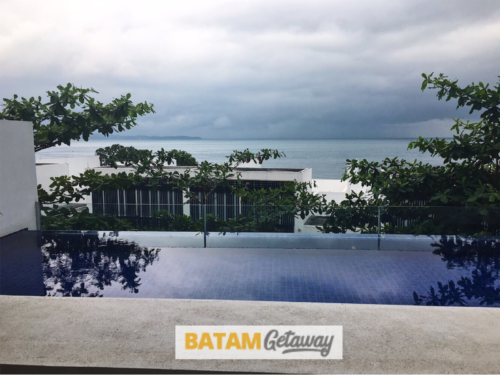 And of course, the main attraction of each villa at Montigo Resort Batam, the private pool and its captivating sea view. Now we are really talking about prestige and privacy here. On the second storey, there will be 2 bedrooms, both of which have their own attached bathrooms. The master bedroom comes with a king-sized bed and a day bed. The room just radiates space, coolness, and cleanliness. The other room is a twin-bedded room. 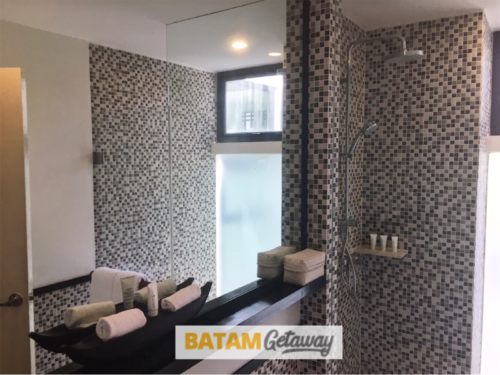 In any case, the main differences between the 2 rooms are the slight difference in room size, bathroom size, and the day bed. Nothing else. 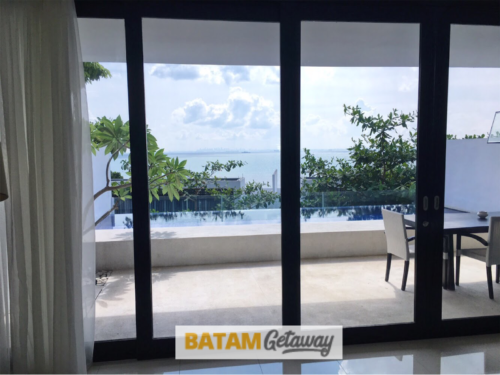 Both have the same exquisite views of the sea and basic room amenities. 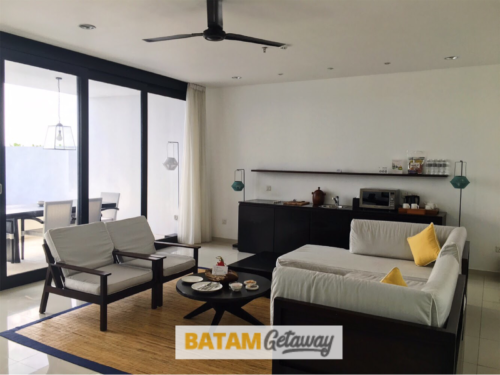 On the third storey of 2-bedroom villas at Montigo Resort Batam, we have a big sun deck (courtyard). 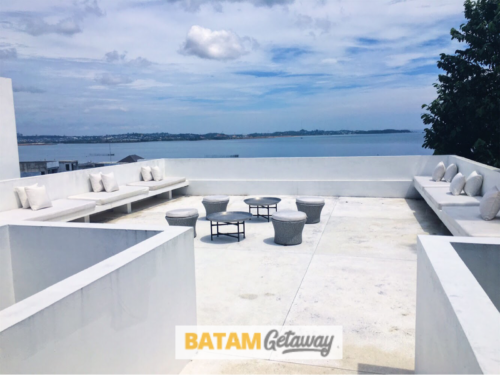 You can use this area to relax with your family and friends, enjoy the sky, the sea, and just soak in the scenery with all your five senses. You could even do your own BBQ, order a Mahjong table, or even some board games (at additional charges). One of the main activities of staying at a resort has to be going for a spa / massage. 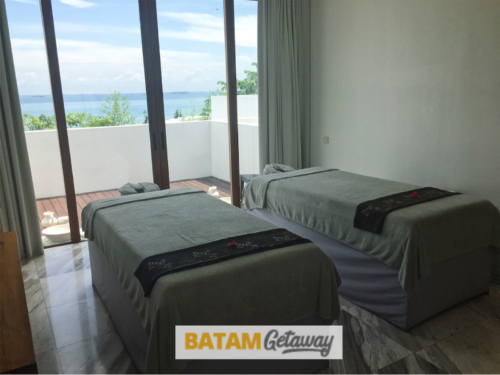 Montigo Batam is pretty well-known for its high quality spa and massage treatments. We were pleasantly surprised to know that we could choose whether we want a female masseuse or a male masseur. We tried the 20-finger massage done by 2 masseuses, who simultaneously massage our backs. They were really good and a really unique experience. 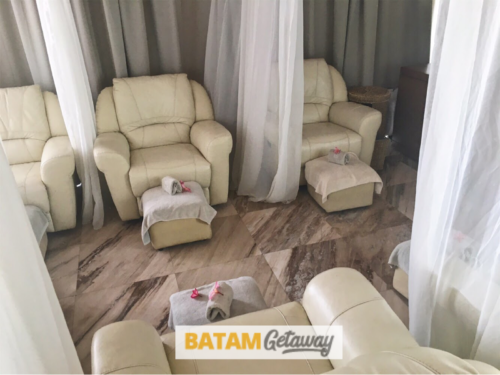 They have an area for feet massages as well as individual rooms for body massages. The whole place really felt serene, elegant, and simply relaxing. When you are somewhat ‘stuck’ in a resort, having great hang out places that serve good food & drinks are life savers, and to a certain extent, an activity in itself. 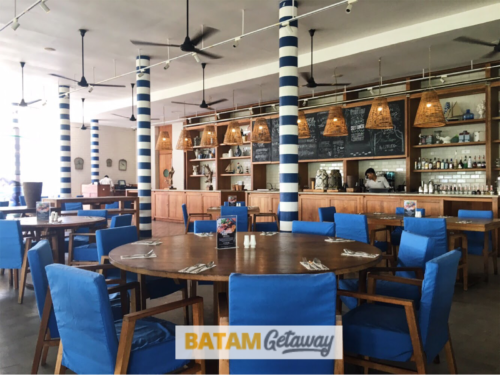 Fortunately, Montigo Resorts Batam has 3 such F&B outlets. 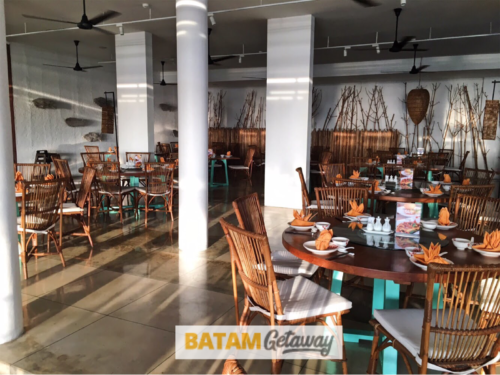 This is the resort’s main restaurant and it’s where you’ll go for your breakfast, and even lunch & dinner. 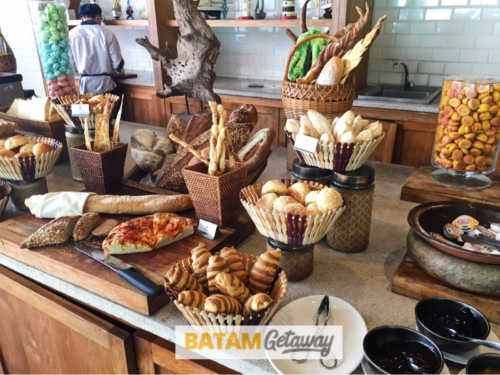 On non-peak weekday stays at Montigo, guests will not be served a full buffet breakfast. Instead, you will get to choose a main breakfast set from the menu. Nevertheless, there will still be a small area for some buffet items (roti prate counter, bread, pastries, and deserts, all of which are baked in-house). This is a Chinese-inspired seafood restaurant that is only open in the evening. On weekends / during the holiday period, you would need to make advanced reservations as they are full most of the time. Although, the seafood meals are fresh, they are priced similar to a restaurant in Singapore. 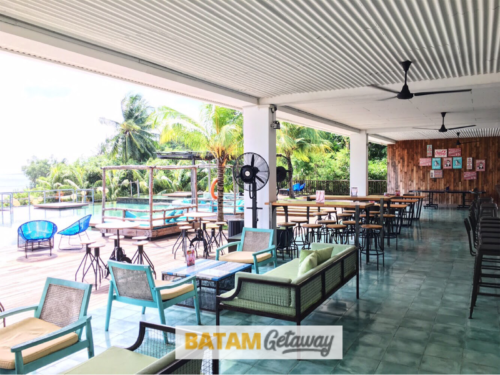 This is a beach club and bar that primarily caters to your entertainment, food & drinks needs. There is a snooker table, foosball, darts, karaoke bar/ room, and shisha-smoking corner. There’s also a swimming pool and pool-side lounge. The name says it all. It’s for the little boys and girls. They have kid-sized splash pool, playground, and outdoor sand area. They also offer guided activities such as art & craft and cookie baking. Water Sports – One of the many reasons people stay at a beach resort. They offer Banana Boat Ride, Wake Boarding, Jet skiing, and Kayaking. 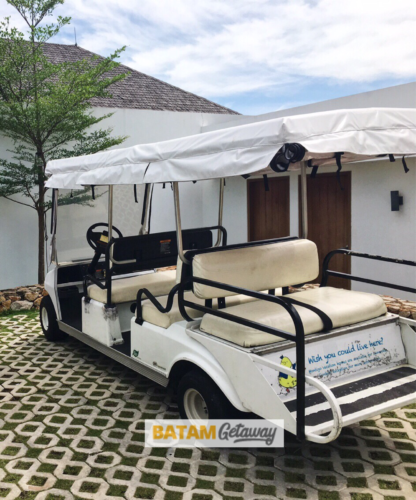 The resort offers complimentary buggy service to go to anywhere within the resort. You’ll just need to call the reception from your room and it will come within 2-3 minutes (during non-peak season) and within 10 minutes (during peak season). 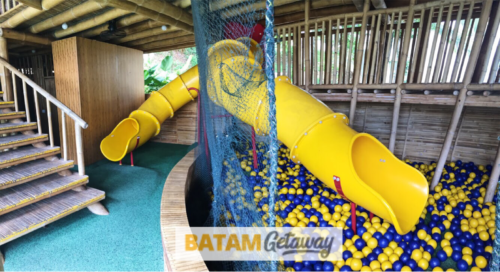 Although priced higher than most other hotels and resorts in Batam, Montigo Resort does have its unique offering. The resorts offer nothing but villas that all come with a private pool and breath-taking sea view. Each villa comes with a living room, kitchenette, and a sun deck. In terms of design and layout of the resort, it oozes elegance, simplicity, and modernism. 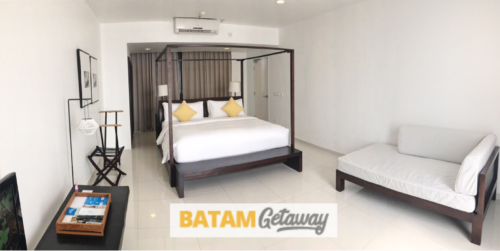 Our 2D1N Montigo Resorts Batam weekday package in a 2-bedroom villa for 4 persons costs S$99 per person. 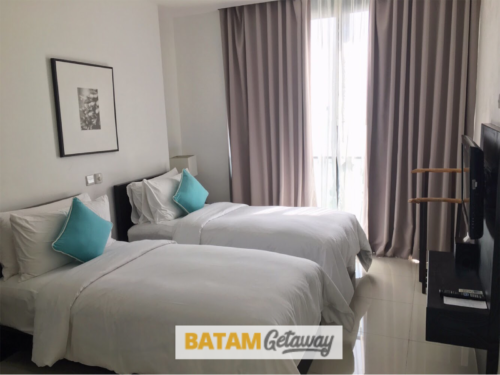 It includes 1 night stay with breakfast, 2-way ferry tickets from Singapore, and 2-way Batam land transfers (to and from Batam ferry terminal). Verdict: 3 words: Exclusive, Modern, and Family-Oriented. Best enjoyed with a group of friends and a couple of family members. Must stay at least once in your life!